The crazy life of former Miss Wyoming Joyce McKinney is told firsthand in the latest documentary from the great Errol Morris (The Fog of War; Mr. Death). McKinney’s battle against a group of Mormons for control over her lover made her a tabloid sensation in the late 70s and she’s not afraid to relate every detail of her experience. Inaccuracies in her story arise as snarky journalists and related parties are interviewed concerning McKinney’s past indiscretions. As the 1980s progress, the former blonde bombshell retreats from the public eye and transforms into a paranoid recluse, at least according to her home video footage at the time. The film’s real craziness begins about three quarters of the way through its 87 minute running time as McKinney resurfaces in the papers after commissioning the Korea-based cloning of her deceased dog, Booger. Sometimes truth is stranger than fiction and all that. Unlike the true life tale of the chimpanzee in Project Nim (also releasing today), Tabloid doesn’t have a lot to offer in the way of information outside of what is already out there. Facing McKinney head-on results in the occasional laugh, at one point she constructs a metaphor involving a parking meter and a marshmallow, but viewers are left knowing little about her outside of previously held assumptions. The film’s subtext, which would presumably involve the power of the media, is kept surprisingly sparse in a manner that gives the film itself a tabloid-like feel. Morris frames his subjects at slightly unconventional angles and peppers their interviews with bold onscreen titles and jump cuts that result in snippets of information that could serve as headlines themselves. His familiar use of stock footage from random, but applicable sources is also present though it ultimately serves to merely provide much-needed breaks from the talking heads as well as a slight chuckle or two. The result is an endlessly interesting story told in a film that feels more Broomfield than it does Morris (not that that’s a bad thing). 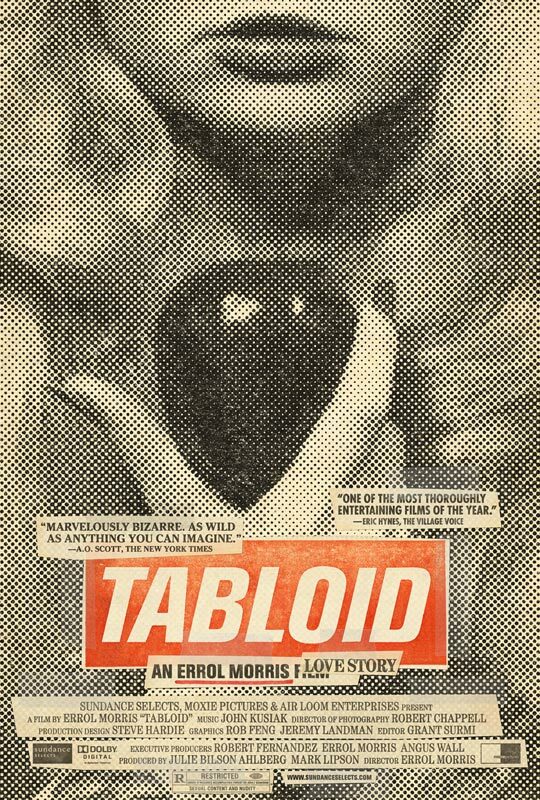 Tabloid opens today at the Ritz 5.